This is Ar duino Nano to UNO Shield Adapter Board. Red board and the colorful female pin headers make your project more impressive. It is very popular Ar duino project production. – Use multi-color female header so that the interface is easy to identify and particularly noticeable. – Onboard 500mA resettable fuse to protect power supply from the USB port and the DC jack at the same time. 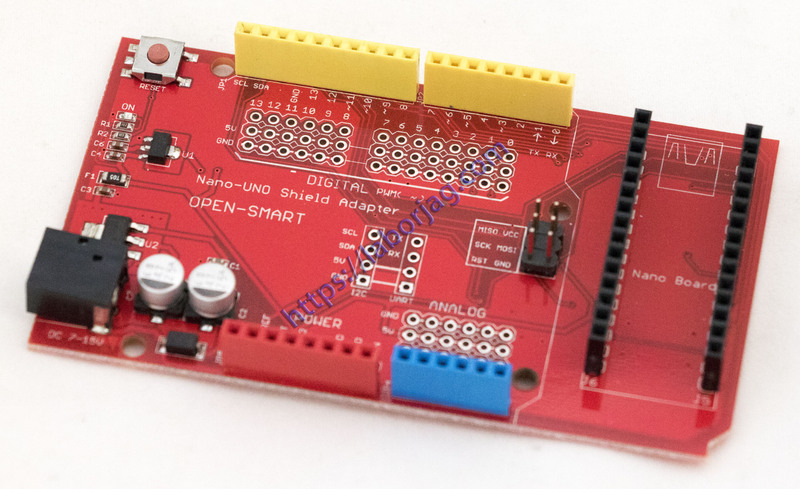 – Leads out more GND, 5V pins, UART serial interface and I2C interface, so it is more convenient to connect it to peripheral modules without additional IO expansion shield. – Onboard 5V and 3.3V voltage regulator circuit. – Onboard DC jack socket and it can be powered by an external battery so it allows you to show your projects in the outdoor without the PC.